Looking for a reliable and powerful disk catalog organizer to organize your huge collection of disks? WinCatalog 2018 disk catalog organizer is a perfect solution! On the market since 2001. Automatically create a catalog of all files, stored on your disks (hard disk drives, DVDs, CDs and other data storage devices): automatically grab ID3 tags for music files, Exif tags for image files (photos), picture thumbnails, thumbnails and basic information for video files, contents of archive files, ISO files, and much more. Organize your file catalog, using virtual folders, tags (categories) and user defined fields, and find files in seconds, using powerful search, even when disks are not connected to the computer. Also easily find duplicate files. Your catalog can be automatically updated through command line and tast scheduler. And no matter how huge your collection of disks is - you will always have your file catalog on hand, perfectly organized. "Great program - finds "lost" files in a heartbeat. I was able to consolidate several hard drives in short order. Thanks WinCatalog!" "First of all congratulations for your fantastic programm, I have a lot of Harddisks, Cd's and DVD's and it is very easy to find my data now." WinCatalog 2018 disk catalog organizer is database driven. It uses the industry standard SQLite database engine in the core. This helps to organize disk collections of any size. No matter how many disks, files, or folders are stored in your collection – WinCatalog 2018 will handle all of them! For video files WinCatalog extracts basic information including thumbnail, codec, video frame resolution, audio tracks information, etc. In addition to Contact manager and Tag manager, WinCatalog 2018 has a new Location manager that helps to manage physical locations easier. You can add all locations, say “box 1” or “cd wallet 2” and associate every item in the catalog with the location. 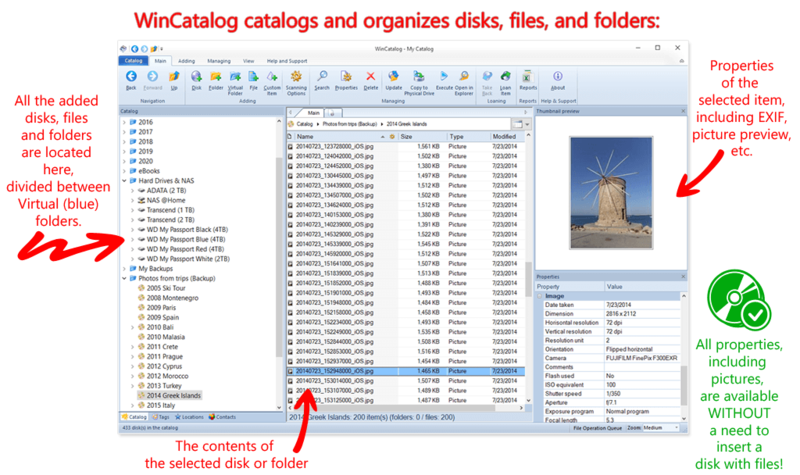 This will help to organize your catalog better and find disks and files faster. 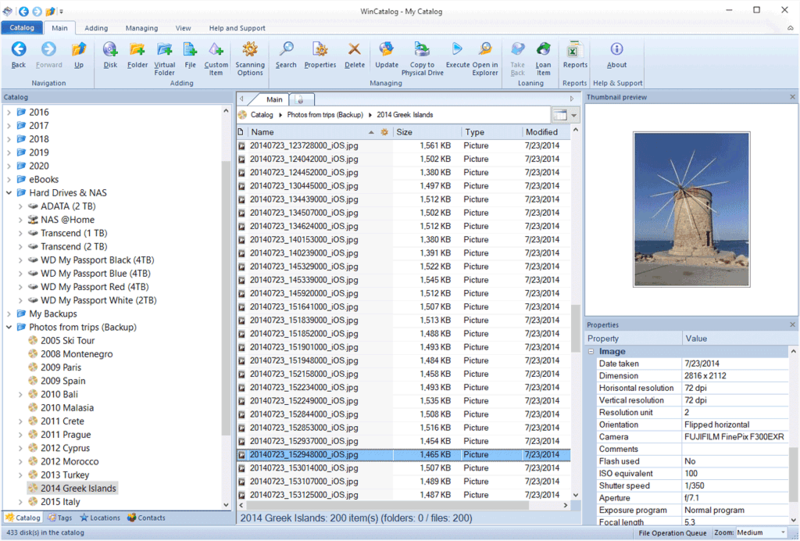 WinCatalog 2018 disk catalog organizer has a tabbed interface, that allows you to keep several various search results simultaneously.